As we’ve mentioned here previously, science can be a slow process. Researchers spend a long time — sometimes upward of five years — gathering enough people with a particular disease to study, collecting samples and data from them, analyzing that data, and then publishing the results. Imagine if you had to gather, analyze, and repeat for each different condition or trait. And then to be more confident in each answer, you had to gather, analyze, and repeat again. You’d be in the shower for a very long time. Imagine instead an ever-growing group of people who’ve agreed, through an Institutional Review Board ethics-approved process, to contribute their genetic data in the pursuit of science. These generous people answer surveys regularly on everything from nose shape to drug response to whether they’ve had breast cancer. They do all of that quickly and conveniently, over the web. We know that this system works. It’s already led to discoveries in the genetics of common traits as well as Parkinson’s disease. With our latest paper, “Efficient Replication of Over 180 Genetic Associations with Self-Reported Medical Data”, we provide the broadest demonstration yet of the power and versatility of 23andMe’s research platform. Published today in PLoS ONE, this paper investigates nearly 400 previously reported genetic associations for 50 different conditions in more than 20,000 individuals of European descent. We were able to replicate about 75% of the associations we expected to replicate, proving that we can obtain high quality findings from self-reported data. Our study also serves as the first independent replication for several associations. Of the associations we did not replicate, it is likely that many factors are at play. Our database, which is population-based and therefore unselected for specific health conditions (with the exception of a few conditions for which we have research initiatives), currently has small numbers of cases for rarer diseases. Some conditions are also more challenging to diagnose or more difficult to self-report accurately. Both of these issues would hinder replication efforts. And although not something we would assume, it is also possible that some of the original findings were false positives. A genetic association study on such a scale has never before been attempted, but 23andMe’s innovative research platform makes investigating hundreds of genetic factors in dozens of different diseases straightforward. This study took only about a year from start to publish, and we can easily repeat it in the future. As our database grows, we expect to be able to conduct even bigger studies and make an even greater impact. We recently launched an initiative to learn more about the genetics of disease in African Americans, a group that is extremely underrepresented in — and therefore currently benefiting the least from — genetic research. 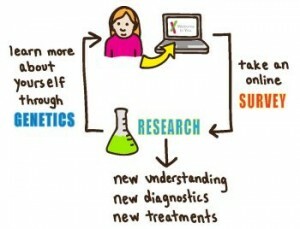 23andMe’s recruitment and research platform is uniquely positioned to advance knowledge in this and other areas that are challenging to investigate using traditional research models.